When terror struck Mumbai in November 2008, "the US was as obsessed as India" to dismantle the terror network and the US intelligence personnel were deployed to help the Indian government, he said at the HT Leadership Summit in New Delhi. US had no evidence that Pak was aware of Osama bin Laden's presence in its soil, Obama said. New Delhi: The US had no evidence that Islamabad was aware of 9/11 attacks mastermind Osama bin Laden's presence in Pakistan, former American president Barack Obama today said. On asked about terror emanating from Pakistan, Mr Obama said, "What is true, and an understandable source of frustration is the view, that sometimes there are connections between explicit terrorist organisations based in Pakistan and elements that are connected to various more official entities inside Pakistan." Answering a question whether the Pakistani government was aware of Osama hiding in Abbottabad, Mr Obama said, "We had no evidence that Pakistani government was aware of Osama bin Laden's presence there but that is something obviously we looked at. I will leave it you to characterise beyond what I just said." Laden was killed by US Navy Seal forces in May 2011 in a surprise raid at Abbottabad, where he was found to be living discreetly with his family and close aides. 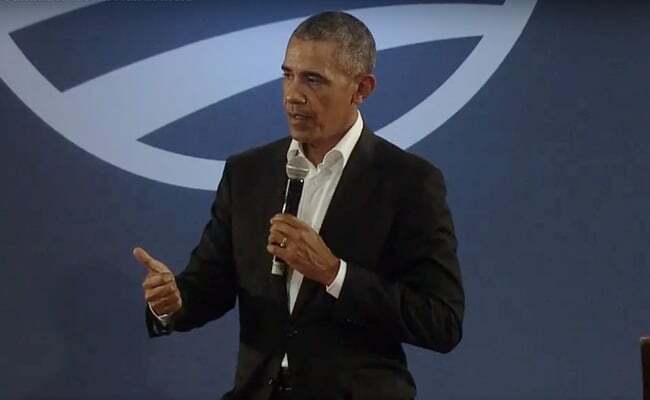 On whether he was disappointed over the little progress that has taken place between India and US nuclear power giants GE and Westinghouse Co to build atomic reactors in India, Mr Obama said his role was to to give an opportunity for the American companies. "My job was not to guarantee that the deal goes through. The goal from my perspective was to India, which had a significant nuclear infrastructure, remarkable scientists, and need for energy... we recognised the reality and put the nuclear issue on a stable footing so that it was not an impediment to the strong bilateral relations," he said. According to the Indo-US nuclear cooperation agreement signed in 2008, the two US companies are to build six atomic reactors each in Andhra Pradesh and Gujarat. Currently, negotiations are on between Westinghouse to build six reactors of 1208 MW each at Kovvada in Andhra Pradesh. Mr Obama also said the US worked "very hard" to get India into the 48-member Nuclear Suppliers Group. "We did not get cooperation from every country," he said, without naming any country. When asked whether he blames China for it, Mr Obama said, "In international affairs, it is hard to distinguish between motives of any given country. I wouldn't hazard to say in a definitive way that China's objections were based on its views of competition." India's quest to gain a place in the elite NSG club has, on several occasions, met with opposition from China.